Monday, February 1, from 11:00 a.m. to 1:00 p.m.
A dynamic exhibition which explores the life and career of Abraham Lincoln opens in early February. Abraham Lincoln: Self Made in America was developed by the Abraham Lincoln Presidential Library and Museum. In addition to Lincoln’s life, the exhibit will also showcase Orange County’s connection to Lincoln with artifacts from Mission San Juan Capistrano and Disney’s “Hall of Presidents.” Light refreshments will be served. Event Fee: Free. 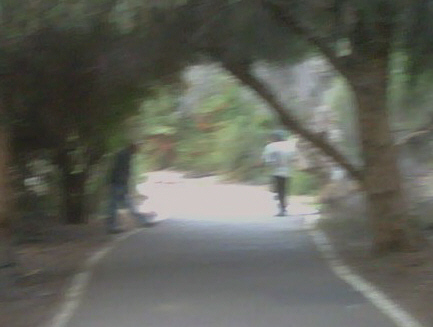 In our continued research into the problem of men engaging in lewd conduct at Santiago Park, we have found a report by the Santa Ana Police Department, dated 2001, indicating that the City of Santa Ana has known about this problem – for over 25 years. 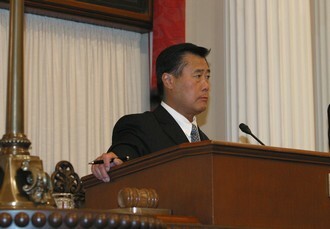 SANTA ANA, Calif., Jan. 19, 2010 (GLOBE NEWSWIRE) — The City of Santa Ana wants to make sure new and existing businesses not only survive during this tough economy, but thrive and prosper. In an unprecedented/pioneering two-hour seminar, the city and its partners will provide Santa Ana businesses the strategies and resources to remain competitive and succeed in a tough business environment. (Santa Ana, CA)— As the second in a series of storms brings severe weather today, local cities including Seal Beach and Westminster are keeping the community informed by activating Orange County’s regional emergency notification system, AlertOC. As the only Democrat serving in the State Senate from Orange County, State Senator Lou Correa has been on the front-line fighting for his constituents. Senator Correa has served the citizens of Orange County as an Assemblymember, a County Supervisor and Senator. With a tireless work ethic, and a great commitment to the people, Senator Correa has consistently fought and won for Orange County. Please join the Democratic Foundation of Orange County for a luncheon in honor of Senator Lou Correa. 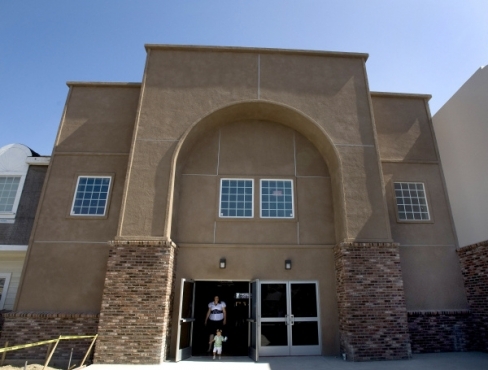 Santa Ana’s Templo Calvario is inviting community stakeholders to join them to learn about applying for an exciting capacity building opportunity, funded by the Compassion Capital Fund (CCF), at the 2010 Bidders’ Conference. Learn about the training, coaching, mentoring and sub-award funding available for capacity building. Grow in four (4) areas of capacity – Leadership Development, Organizational Development, Program Development, and Community Engagement Walk through the application process to participate in. Learn about the training, coaching, mentoring and sub-award funding available for capacity building. Grow in four (4) areas of capacity – Leadership Development, Organizational Development, Program Development, and Community Engagement. 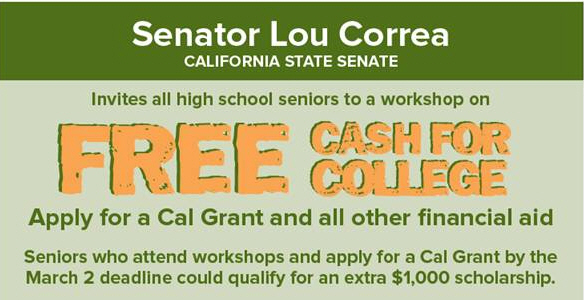 State Senator Lou Correa has begun outreach efforts to help Orange County High School Students apply for Cal Grants and Federal Financial Aid. The deadline to apply is March 2nd, 2010. The District Office is hosting a series of 4 Cash for College workshops in Orange County: Thursday, January 21st at Santa Ana High School, Thursday, January 28th at Valley High School, Saturday, January 30th in Westminster, and Thursday, February 4th 2010 at Anaheim High School. Remember the mini-scandal that surfaced when Sue Vaughn, the Principal at the Orange County High School of the Arts (OCHSA), interfered with the publishing of the school paper because she didn’t like something that a student reporter wrote about a school vendor? That happened in September of last year. You can read all about it by clicking here. Vaughn picked on the wrong student. The reporter’s mom turned out to be a media bigwig. Now it appears that her mom had major political pull too. 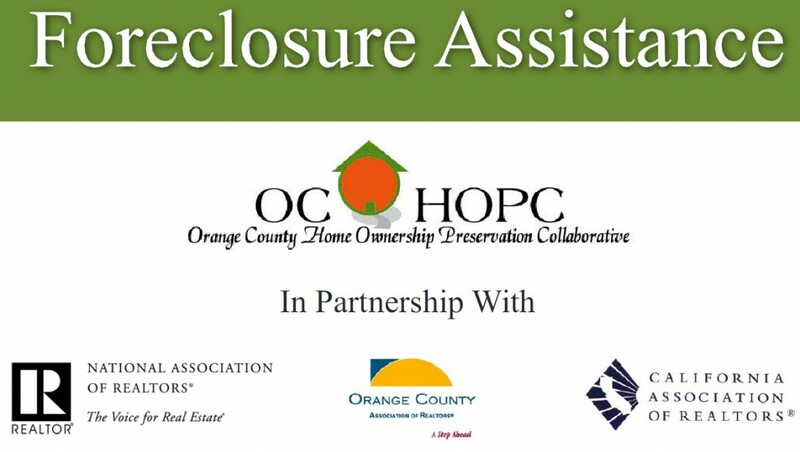 A community counseling and foreclosure assistance seminar will be held in Santa Ana on Feb. 11, at Calvary Church, located at 1010 N. Tustin Avenue. HUD-Approved housing counseling agencies, lenders and non-profit legal counselors will be on-site to assist you for free. The idea behind this bank was positive, but from the start the bank was mired in controversy. And local blogs questioned whether the bank’s directors had chosen a good time to open their enterprise. By 2008, the U.S. economy was crashing, and money to lend became hard to come by. And local businesses weren’t looking for cash. 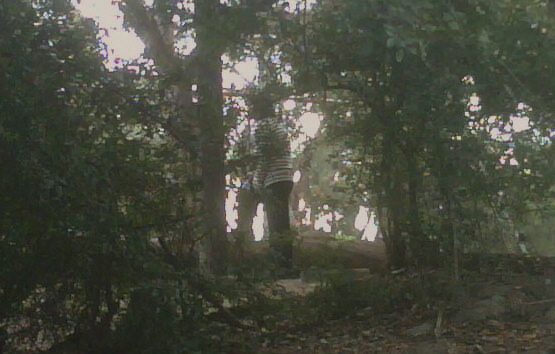 Many were looking for the exit. 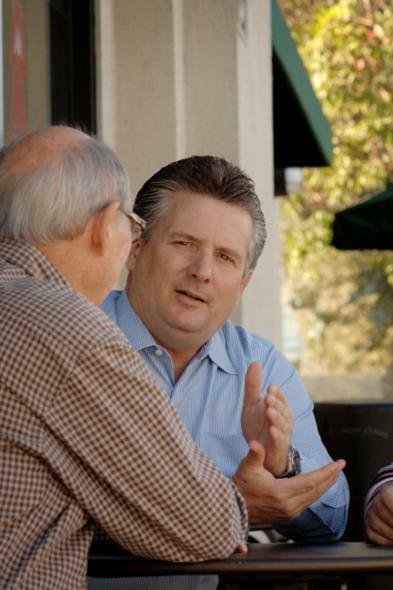 And the Santa Ana Business Bank shares dropped from $10 to $4.40, according to online reports. Currently they are valued at $3.50, according to NASDAQ. Team Kids has chosen the O.C. 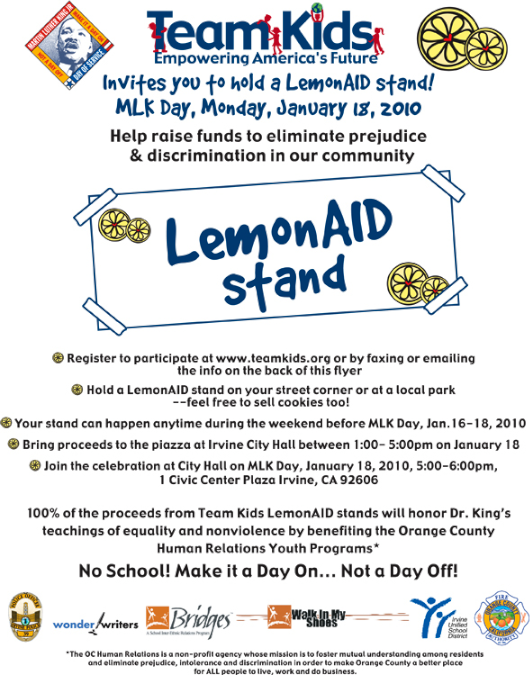 Human Relations Commission’s BRIDGES youth programs to be the beneficiaries of their LemonAID Stands on MLK Day and they’re inviting kids of all ages to join them! Team Kids has registered their LemonAID Stand with Disney’s Give A Day/Get A Disney Day promotion – so anyone who volunteers to setup a LemonAID stand this weekend in honor of Martin Luther King Jr. Day can earn a free visit to Disneyland while helping to support OC Human Relations! To register your LemonAID stand and receive Disney’s “Give a Day, Get a Disney Day” promotion, click HERE.